As Charles Kingsley said, ‘No-one can say water babies don’t exist because no-one ever saw one not existing’! But look at this beauty come all the way from ‘God Know Where’ to die on our roadside at the back of our farm. I found it yesterday afternoon whilst fixing the back fence. At first I thought it was a dead sambar because of its size and colour. In a life spent extensively in the bush I have only ever seen four of these things (including this one), though black wallabies and grey kangaroos abound hereabouts every afternoon. 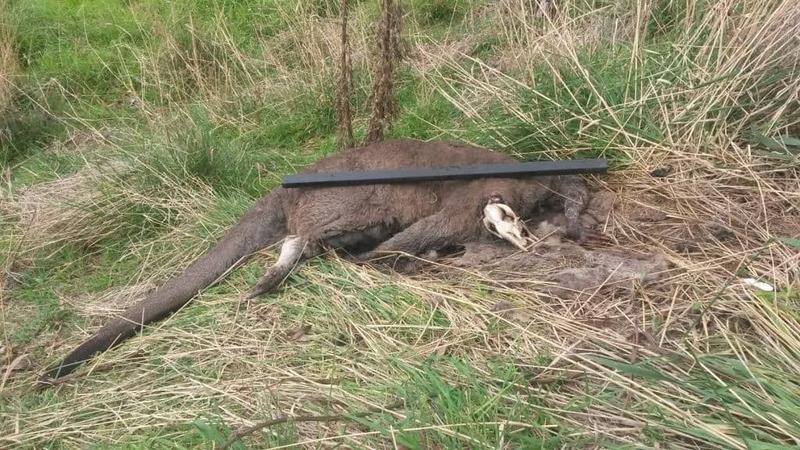 That is a 120cm (4’) fence dropper approx 50mm x 50mm (2” x 2”) lying along it. You will note its right arm is over 50 cm (2’ long) and thicker than a ‘longneck’ beer bottle. Its tail is thicker than a 2 litre bottle of coke. Its front claws, 30cm (1’) below the right hand end of the dropper are 100mm (4”) long! It is/was a wallaroo, the marsupial version of a Great Ape. Unbelievably, my father Lawrence once (around 1958) managed to kill one of these with his bare hands, as one of the beagles had it bailed – and it would otherwise have killed the dog. You can see that he was a very strong man, much moreso than I. Mind you he wore some of its trophies on his body to his grave! Those claws and teeth are sharp – and just look at the rear claw: it is over 75mm (3” long)! An awesome opponent. No match for a motorcar either though by the looks! I have seen many other strange creatures in the bush betimes (though strangely never yowies or black panthers); oddly critters unreported by others. When such a creature as this can make its way from some hidden fastness to my very back door merely to die, what wondrous creatures may still lurk out there somewhere living yet? When I do come across some astounding creature in the bush, I no longer tell the authorities: I once reported a kind of extinct rock wallaby. The protection it then achieved ensured its fate! Alas! PS: The creature was confirmed by the Department of Funny Names (aka DPI, etc) to be a wallaroo, the only brown one ever reported in Vic – but clearly not the only one here.